Reliance Industries has offered $13.5 billion to buy LyondellBasell Industries, 12.5 per cent more than its previous offer, and may sweeten it further to get control of the bankrupt petrochemicals firm. Mukesh Ambani-led RIL had in November offered about $12 billion in cash for a controlling stake in Lyondell and a couple of weeks ago sent a letter increasing its offer to $13.5 billion, sources familiar with the development said. RIL has offered to buy about $2.2 billion in new stock and support a separate $2.8 billion rights offering by Lyondell to take the company out of bankruptcy. Most of the remaining would be in cash, they said. The revised offer has not found much support from the US firm and RIL may sweeten the offer further, the sources said adding the company had time till February to make another offer. An RIL spokesperson, however, declined to comment. The Wall Street Journal, meanwhile, reported that Lyondell's board had rejected RIL's revised offer. It saw Lyondell valuation at about $15.5 billion, $2 billion more than RIL's revised offer. Lyondell had a year ago filed for Chapter 11 bankruptcy protection under the US law after being unable to meet its debt obligations when global economic downturn saw demand dropping. Lyondell, the world's third-largest independent chemical company, would give RIL petrochemical plants, two oil refineries and access to the US fuel market. RIL had this week raised Rs 2,675 crore (Rs 26.75 billion) through treasury stock sale, possibly to fund the Lyondell buy. Sources said RIL's bid for controlling stake would be subject to several conditions, including the approval of the US government. In 2005, Chinese oil company Cnooc Ltd withdrew its $18.5 billion takeover bid for California energy firm Unocal Corp owing to resistance from politicians in Washington. A year later, the then Bush administration cited security concerns to reject takeover of P&O Ports by Dubai Ports. 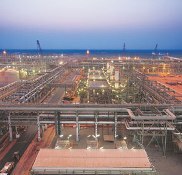 Lyondell has large capacities and access to markets, needed for RIL's petrochem business to grow outside India. If a deal is struck, it would create a global energy and chemicals powerhouse with nearly $80 billion in combined revenue. Lyondell is the world's third-largest chemical maker, and both companies have oil-refining operations. Sources said RIL wants to close the deal by fiscal end. It has $ 4.16 billion in cash and cash equivalent instruments. Lyondell would give RIL access to the US fuel market, the world's biggest, and make it the largest producer of polypropylene used in refrigerator castings.